We know that there can be a lot of questions if you've never been on a track day before. Even if you have, we know that you might still have a question or two about our track days, so to help things along, here is an ever expanding list of questions and answers. If you cannot find the answer to your question here, do contact us, and we’ll get back to you as soon as we can. What is a Track Day or Car Control Day? A Track day is a non-competitive, controlled event where you can allowed to drive your car around a real established motor racing circuit or closed airfield without speed restrictions. We require that you hold a full driving licence, and that your car is road legal. Driving manners are expected to be high, and beginners are completely welcome. Car Control days are designed to be fun, safe and also educational. As we run on a wide open space around cones there is also very little risk of impact damage to cars which naturally is of major concern to many participants. The actual driving activity runs from 10am to 4pm with a lunch break. You may find that booking some introductory tuition is a good idea. It's available at all of our events and is most often able to be booked in advance along with the purchase of our events from a drop down box on the relevant page. The common misconception is that track driving is more dangerous than road driving. It is in fact the other way round. On track you have no oncoming traffic, run off areas, and a crash helmet for most events. We take every reasonable precaution in making sure you get your precious car home in one piece. If you do spin off, circuits have soft foam walls and gravel traps in the most common 'error' points, but you should always be aware that there is a chance you may damage the car, and insure accordingly. If you would like to arrange insurance, please call the office and we can help you. On a car control day, you should expect quite high wear and tear on your tyres. You might want to call ahead and we can arrange new tyres for you. Don't worry, people can talk the talk but only a few can walk the walk. You can go at whatever speed you are comfortable with. The rules that we have set for track driving mean that you will not get hassled by faster cars. When there are 2 or more cars on track at once we remove all forms of competition by banning stop watch timing and aggressive over taking. You never know, you may be seriously quick out there and put much more powerful cars or experienced drivers to shame! Do I need a crash helmet? We require drivers to wear a helmet on both our trackdays and car control days. If you don't own one, don't worry! You can hire one from us for just £10.00 for the full day by paying cash at the event. Yes of course, charges for passengers can vary according to our events. Usually for a track day or car control day the charge is nothing more than £10.00 for the duration of the event. If Mazda on Track or its track partners are unable to provide the event due to unforeseen circumstances such as, but not limited to, adverse weather conditions, industrial action, government restriction or other restriction imposed by the circuit or venue, Mazda on Track will issue a credit at its discretion up to the value of the event and activities booked. Events that suffer a delayed start or curtailed early will not normally qualify for credit. Any credit will be issues at Mazda on Tracks sole discretion. For event specific questions please see the event booking page which will provide information about timing, rules of the day including noise limits and safety as well as local area information for hotels or B+B's. helpline on 1926 680 020. 2 - Click on a date that interests you. 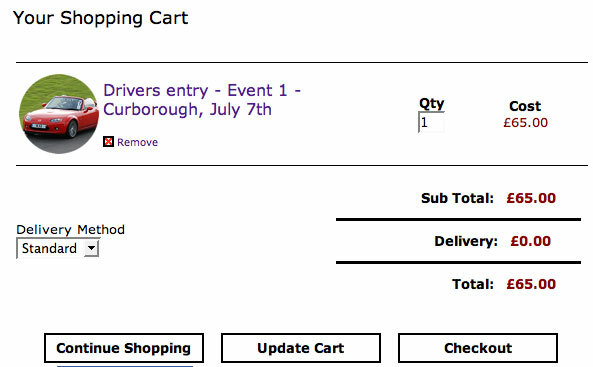 3 - Read down the page to check the details of the event, if you wish to book simply press ADD TO CART. 4 - You will be taken straight to your personal 'Shopping Cart', which contains any events you wish to book. You can add to them, or remove them from there as often as you need. When you are finished, click 'CHECKOUT'. 4 - If you are new to booking with Mazda on Track, create an account and password with us to make future bookings faster. Then simply pay as you wish, and we will send you confirmation emails to confirm your bookings. If you have your MoT Drivers Club number, enter it in the discount area and watch the prices drop! Remember, you do not have to have a paypal account to make a payment. If you have any more problems, please don't hesitate to contact info@mazdaontrack.co.uk who can help with your booking.